Virtual reality brightens up a leisurely pastime in this vintage video game-inspired puzzle. Jim Golden is a photographer based in Portland, Oregon. He brings an artist’s eye and an enthusiast’s passion to his work, creating striking imagery that strives to capture the essence of his subjects. Rather than imposing a conventional standard of beauty, Jim accentuates what is unique about a subject and shares this special quality with the viewer. Jim’s inspiration for his series of photographs of neatly arranged collections came after running into a friend who had an extensive collection of over 700 scissors. After photographing the scissors collection, Jim dove further into the world of unique and strange objects that are sources of obsession and fascination to collectors. Visit our blog to see how Jim Golden captures collections through his camera lens. The retro video games are a great touch - haven't seen anything like this before. The puzzle does not have an excessive amount of pieces. I was searching for a birthday present for my bf and was struggling... until I found this! He loves video games and we were on the hunt to find a good puzzle that wasn't your typical scenery puzzle. This was perfect! This puzzle is very well made, the different shapes make it fun & complex & the pattern of games & machines is very fun to put together. 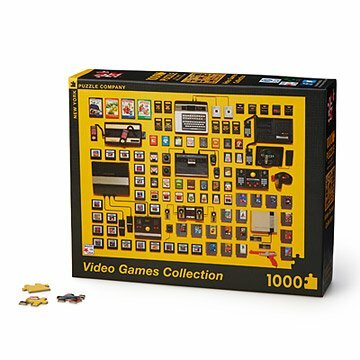 The puzzle shows a very nice progression of game system/games through the years. Very clear pictures of the products, easy to see/read. While I don't care much for playing video games with my husband, we do love doing puzzles together. Perfect gift. Has been a fun thing for both of us to do together, but is super challenging. Only thing I wish is that the picture quality on the box was a little better. Could have been visually better. Could have been better if it had pictures of characters from video games instead of just hardware.